What a combination: great, year round outdoor beauty, incredible hiking opportunities, extraordinary shopping and dining venues, plus hundreds of inns, bed and breakfasts, and hotels that will fit anyone's taste and budget. The Hocking Hills are about an hour southeast of Columbus, in the foothills of the Appalachian Mountains. No matter how many times you visit the area, there's always something new to find. The heart of the Hocking Hills are the famous 6 named rock formations, that make up the Hocking Hills State Park, plus lake Logan. Nearby is Rockbridge State Nature Preserve, Hocking State Forest, Tar Hollow State Park and Forest, Wayne National Forest and Kessler Swamp State Nature Preserve. It is real nature lover's smorgasbord. The word Hocking is a shortened word for the Delaware Nation word Hockhocking which roughly means bottle river and it is the name of the Hockhocking River. On most state maps today, the Hockhocking River has been abbreviated to just the Hocking River. The scenic features of the 6 areas of the Hocking Hills State Park complex are carved formations in the Blackhand sandstone. This bedrock was deposited more than 350 million years ago as a delta in the warm shallow sea which covered Ohio at that time. Subsequent millions of years of uplift and stream erosion created the awesome beauty seen today. Another theory is that they were carved out by the gushing water of melting glaciers that carried bits of harder stone that had been crushed by the glaciers forming a very fine grit that acted like sandpaper on the softer sandstone. The hollows and caves of the park complex have long attracted Ohio's residents. Evidence of the ancient Adena culture illustrates man first inhabited the Hocking Hills recesses more than 7,000 years ago. 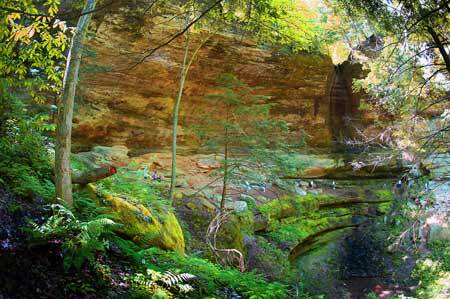 Towering cliffs, waterfalls, and deep gorges are all found in Hocking Hills State Park. Hocking Hills State Park offers such great diversity and such incredible outdoor options, that the Hocking Hills State Park area will call you back again and again. The beauty of these areas is unmarred with safety fences and warning signs other than the caveat at the beginning of each trail: STAY ON THE TRAILS. 100' plus drops are common throughout the park without so much as a be careful sign or fence. It is definitely not a place to go wandering about at night. Trails are not well marked, other than being well worn. In extremely steep areas, slippery stone steps have been built to make it a little easier. In areas where there are tight passages, there is usually a work-around-trail that will bypass the narrow section. Pets are permitted in most areas, and for the most part, they'll enjoy the park. Just clean up after them. Small dogs may have trouble with the steep steps in some locations. Conkle's Hollow is one exception and pets are not permitted there. Most of the parks are not handicapped accessible except for Ash Cave and part of Conkle's Hollow. Many of the less popular areas do have restrooms, but with no running water. Cell phones may or may not work in some areas of the parks. 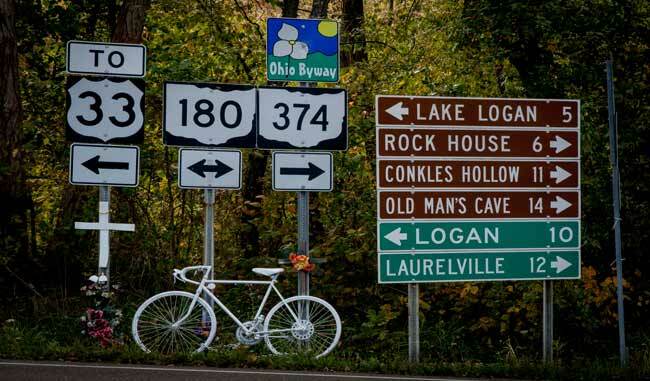 Logan Ohio is the unofficial gateway into the Hocking Hills. There is a visitor center just below the damn that forms Lake Logan that has plenty of information not only about the individual parks, but also other area attractions, inns, bed & breakfasts, and other attractions. Ash Cave is really not what you would call a cave, but is a large overhang of rock. The horseshoe-shaped cave is massive; measuring 700' from end to end, 100' deep from the rear cave wall to its front edge with the rim rising 90' high. A small tributary of the East Fork of Queer Creek cascades over the rim into a small plunge pool. 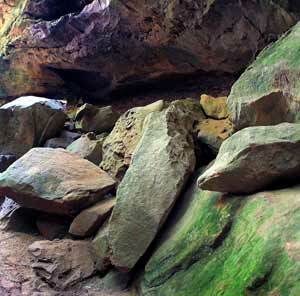 The cave was formed like the others in this region: the middle layer of the Blackhand sandstone common throughout the Hocking Hills, has been weathered or eroded while the more resistant upper and lower zones remained intact. Cantwell Cliffs located in the northern Hocking Hills region on S.R. 374. Its remote location offers those who travel the extra distance to be pleasantly surprised. Many visitors proclaim the Cantwell area as the most picturesque in Hocking County. Access to the Cliff area requires passing through an extremely narrow passage with steep steps. Cedar Falls is located in the heart of the Hocking Hills area. The falls were misnamed by early settlers when they wrongly identified the abundant hemlocks growing in the area as cedars. 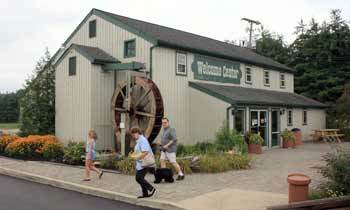 In the mid 1800’s, a grist mill was built above the falls to utilize this water power for grinding grain. Parking is located on the high ground with trails that wind through the cliffs until you reach the canyon bottom and an unobstructed view of the falls. Water volume changes drastically depending on the amount of rainfall in the area. Conkle's Hollow is located on S.R. 374 on Big Pine Road. 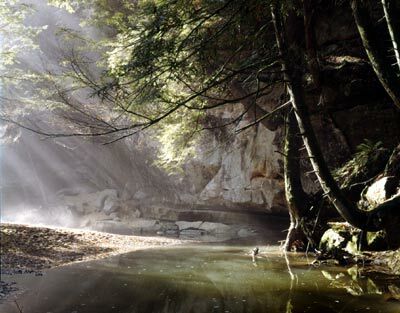 Conkle's Hollow is a rugged, rocky gorge and is considered one of the deepest in Ohio. The valley floor is a veritable wilderness covered by a profusion of ferns and wildflowers while hemlock, birch and other hardwood tower overhead. The growth is so thick in places that little or no sunlight reaches the deep valley floor. Pets are not permitted in Conkle's Hollow. Old Man's Cave is the most popular of all the Hocking areas. Old Man's Cave is located on S.R. 664. There is a visitor center located at the parking area which can accommodate the hundreds of visitors a typical summer weekend can bring to the area. Rock House is the only true cave in the Hocking Hills region. It is a tunnel-like corridor situated midway up a 150' cliff of Blackhand sandstone. Rock House has a ceiling 25' high while the main corridor is 200' long and 20' - 30' wide. The cavern was eroded out of the middle zone of the Blackhand sandstone. 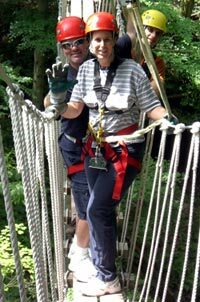 In 2008, Canopy Tours began offering a unique opportunity for thrill seekers willing to pay a tidy sum for zipping through Hocking Hill's tree tops. Located just south of Rockbridge on the east side of SR33, and sharing the same offices as the Windy Hills Golf Course. The Canopy Tours are offered by a private company on private land, so casual spectators are not permitted to watch the overhead acrobatics. The Hocking Hills area is becoming the place to have weddings in Ohio. Not only does the natural features of the area provide the perfect location for the perfect wedding, but with the number of lodging and catering facilities, wedding planners will delight in all the possibilities the Hocking Hills area can provide. With the number of ceremonies performed each year increasing, cabin owners are building on-site chapels. Couples can say "I do" in the most unusual places: on the edge of a gorge, in a cave or next to a waterfall. Honeymoon in a luxurious private cabin complete with hot tub and romantic views. Most facilities offer special honeymoon or romantic getaways that include champagne, roses, couples massage and more.